Many circus operations don't have much money, and, as a result, the animals they use often suffer from inadequate care. The animals, most of whom are quite large and naturally active, are forced to spend most of their lives in the small cages used to transport them, and they are allowed out of their cages only for the short periods when they must perform. The Animal Welfare Act (AWA) merely requires that the animals have enough room to stand up and turn around when confined, yet even these minimal regulations are routinely ignored. In just a two-year period, Ringling Bros. and Barnum & Bailey Circus was cited for 65 violations of the AWA. An animal advocate who worked undercover in a traveling circus was surprised that the circus was often unable to provide adequate water for the animals. Such entourages may visit 150 towns a year, and a clean water supply is not readily available in every location. As a result, drinking water is limited, and cleaning the animals and their cages may take low priority, causing a real hardship for animals like elephants, who normally bathe frequently. Food is often equally limited. Climatically, the circus environment is quite different from the animals' natural habitats. The hot summer months can be especially hard on animals like bears, while others, like lions, suffer most from the cold. George Lewis, in Elephant Tramp, tells of traveling with Ringling Bros. in the winter: "When we went to unload the elephants, we found the long trip had been too much for one of the oldest, Queen. She was lying dead inside a car." Veterinarians qualified to treat exotic animals aren't always present or available, and animals have suffered and died due to a lack of proper medical attention. During the winter off-season, animals used in circuses may be kept in traveling crates or in barn stalls; some are even kept in trucks. 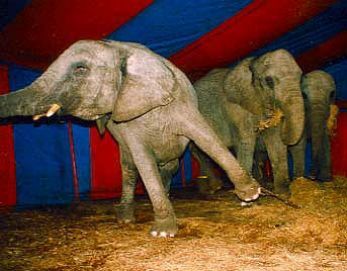 Few circuses have the funds or the desire to put much money into comfortable winter shelters, since off-season housing is used for only a few months per year. Such unrelieved physical confinement has very harmful physical and psychological effects on animals: A study conducted by the Born Free Foundation found that confined elephants spend 22% of their time in abnormal actions, such as repeated head-bobbing or swaying, and confined bears spend about 30% of their time pacing. Physical punishment has long been the standard training method for animals in circuses. Some species are less able to adapt to training techniques than others, and as a result suffer great stress during training sessions. Some animals are drugged to make them "manageable," and some have their teeth removed. The AWA puts no restrictions on what training methods may be used, and, according to former animal trainer Pat Derby, "After 25 years of observing and documenting circuses, I know there are no kind animal trainers." Circus patrons are often shocked to discover that even renowned trainer Gunther Gebel-Williams has been videotaped whipping animals. One former Ringling Bros. employee told the Elephant Alliance how the circus treated one animal: "She was a sweet little innocent brown bear who never hurt anyone... but sometimes she had trouble balancing on the high wire. She was then beaten with long metal rods until she was screaming and bloody. She became so neurotic that she would beat her head against her small cage. She finally died." A Hudson News reporter who traveled with Ringling Bros. reported, in an article dated August 8, 1986, about one chimpanzee's "training": "Repeatedly, he was struck with a study club. The thumps could be heard outside the arena building, and the screams further than that." 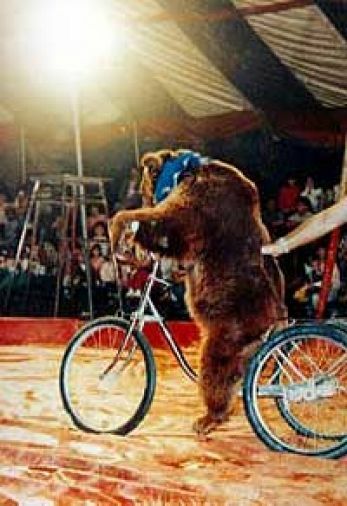 The tricks that animals are forced to perform - bears balancing on balls, apes riding motorcycles, elephants standing on two legs - are physically uncomfortable and behaviorally unnatural. The whips, tight collars, muzzles, electric prods, bullhooks, and other tools used during circus acts are reminders that the animals are being forced to perform. These superficial "performances" teach audiences nothing about how animals behave under natural circumstances. Animals in circuses are often portrayed as either ferocious or stupid compared to their "brave" or "commanding" human counterparts; their true nature is never seen. Given half a chance, these intelligent captives make their own feelings abundantly clear. In 1994, Tyke, an African elephant, ran amok in Hawaii, killing her trainer and injuring 13 others before police shot her to death. Five days earlier, Elaine (another elephant with the same circus) pinned eight children and their parents under a fence that separated the first row of spectators from the circus rings. In April of 1994, Sue, an Asian elephant with the Jordan Circus, picked up her trainer, Rex Williams, tossed him, and then stepped on him, while she was giving rides to two children. In May of 1993, while on the Ringling Bros.' elephant farm in Gainesville, Fla., a circus trainer died of internal injuries after an elephant knocked him down and stepped on his chest. 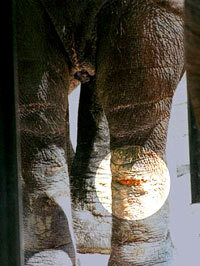 In fact, since 1990, at least 11 people have been killed and numerous others injured by captive-elephant attacks. As the injuries to both humans and elephants mount, the public has come to recognize that exotic animals do not belong in circuses and cages, but rather in their homelands with their families. As Officer Blaine Doyle, who had to shoot 47 rounds into Janet, an elephant who ran amok with three children on her back, noted: "I think these elephants are trying to tell us that zoos and circuses are not what God created them for... but we have not been listening." After the animals have outlived their performing "usefulness," they are either permanently relegated to winter quarters (often cages) or are sold to other circuses, zoos, private menageries, game farms (to be shot for "recreation" or for "exotic" meat), or even research laboratories. They often end their lives no more peacefully or comfortably than they lived them: in confinement, coercion, and misery. As more people become aware of the cruelty involved in forcing animals to perform, circuses that use animals are finding fewer places to set up their big tops. 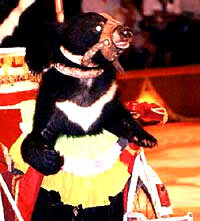 The use of animals in entertainment already has been restricted or banned in several countries, including Sweden, India, Finland, Switzerland, and Denmark. In England, circuses with animal acts are often denied public space. Coquitlam and Langley in British Columbia passed bans after a flaming hoop fell on a tiger during a circus performance. In the United States, several local governments have banned exotic animal acts. Eliminating animal exploitation simply means the increased use of human performers. Write to PETA for information on ways to get an animal display ban passed in your area. 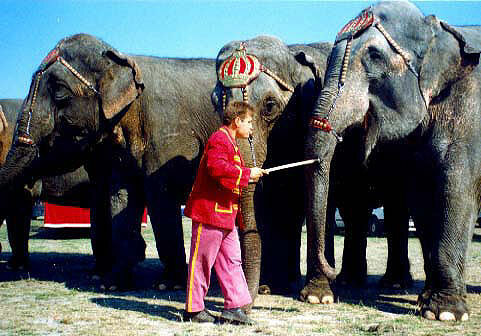 Don't patronize circuses that use animals. 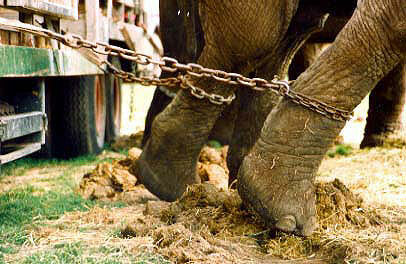 PETA can provide "Circus Check" fliers to pass out to patrons if the circus comes to your town. Find out about state and local animal protection laws, and report any possible violations to authorities. Take your family to see only animal-free circuses, such as the Cirque du Soleil or the Pickle Family Circus.